MIAMI, FL – October 23, 2014 – Florida Foster Care Review (FFCR) is pleased to premiere its “You Matter” photo contest. Through this contest, FFCR will draw attention to the needs and importance of children and youth in foster care, while honoring the volunteers and community members that support them. The contest will also highlight Miamians’ opportunity to take care of our community and each other by contributing to FFCR and other local nonprofits on Give Miami Day, an event sponsored by the Miami Foundation, Knight Foundation and others. FFCR is promoting the contest in conjunction with its weekly series on Facebook and Twitter called “Give Youth…”, which explores the importance of stability and support in a child’s life and future success. FFCR Exec. Dir. Candice Maze honors someone who matters, FFCR staffer Ranetha Jones. FFCR’s photo contest will begin today, October 23, at 1:00 p.m. EDT and run through 5:00 p.m. EST on Thursday, November 20, with the winner to be announced before 11:59 p.m. EST on November 20. To enter, participants must take a photo of themselves holding a sign (handwritten or otherwise) that reads, “You Matter,” next to someone that has made an impact in their lives and then post the photo to Facebook, Twitter or Instagram as specified below. The person the participant chooses to honor could be a parent, teacher, mentor, co-worker or anyone who has made a difference in the life of the participant. The person honored in the photo is encouraged to “pay it forward” by posting a “You Matter” photo of their own. The contest is open only to Florida residents age 14 and over. If a photo entry pictures someone under the age of 18, a signed parental consent form must be submitted to info@fostercarereview.org or mailed to the address indicated before the photo is posted. Please see the contest’s official rules for details. Qualifying photo entries must be posted between 1:00:00 p.m. EDT on Thursday, October 23, 2014 and 5:00:00 pm EST on Thursday, November 20. 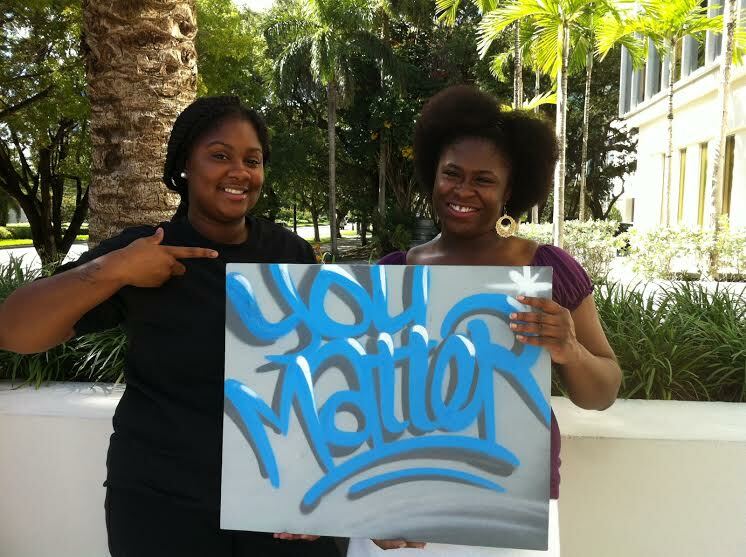 Ranetha Jones tells Kristine Inyang that she matters. “In its work to promote the safety, well-being and long-term success of abused and neglected children, FFCR has seen firsthand the key role that support systems play in the lives of all individuals,” said Candice L. Maze, FFCR Executive Director. 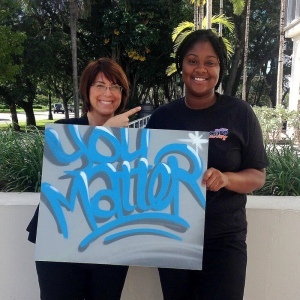 “Through the simple act of telling someone, ‘You Matter’, we hope this contest will both honor those who are making a difference at the individual and community levels, while also reaffirming that children and youth in foster care are one of this community’s top priorities,” Candice added. The participant who submits the most inspiring photo will win a $50 gift certificate, generously donated by a supporter, to Fleming’s Prime Steakhouse & Wine Bar in Coral Gables. All photos will be posted on social media and on FFCR’s website. Full contest rules are available here. About Florida Foster Care Review, Inc.
Florida Foster Care Review, Inc.
Florida Foster Care Review celebra su vigésimo quinto aniversario, y el noveno almuerzo benéfico anual de “Claws for Kids”.